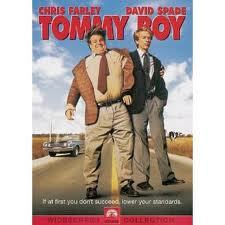 "Tommy Boy" is a movie from the 1990s starring Chris Farley and David Spade. If you have not seen this movie yet, and appreciate comedies, I highly recommend this. If you thought "Wild Hogs" was hilarious then you will absolutely love this one. "Tommy" is someone that apparently cannot do much right. He messes up quite a bit and sets out on the road to help out his Dad's company. With the different antics and pitfalls along the way, there is plenty of room for comedy. If you watched this, what did you think? It is one of the best comedies I have seen. I remember sitting in the movie theater with my siblings and parents with a stomach ache because I was laughing so hard. This movie has been rented by me several times over the years because I forget certain things and I still laugh every time I watch it.